Presented with their bravery awards yesterday, Moree Plains Shire Council general Manager Lester Rodgers, left, bravery award recipient Ashley Jarrett, Mayor Katrina Humphries, bravery award recipient Steve Moloney and Northern Tablelands MP Adam Marshall. 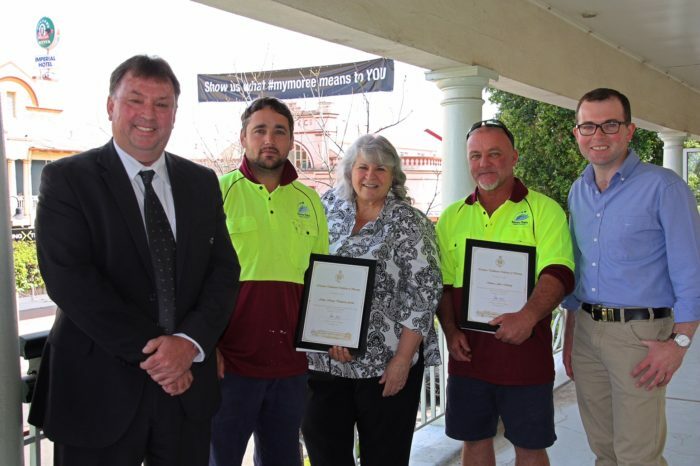 TWO Moree Plains Shire Council outdoor staff members were publicly recognised yesterday for saving the lives of two toddlers in Boggabilla last month. Member for Northern Tablelands Adam Marshall and Mayor Katrina Humphries presented Ashley Jarrett and Steve Moloney with Act of Bravery Awards at a special ceremony in Moree for their “selfless and brave actions” to rescue two infants from a burning vehicle. The pair were on their usual work schedule in Boggabilla last month when they noticed the smouldering car and the young siblings inside. “The quick and brave action of these two men has resulted in two young lives being saved,” Mr Marshall said. Both men were praised at the ceremony yesterday by Mr Marshall and Cr Humphries, attended by Councillors and council senior management. “I congratulate Ash and Steve on their outstanding service to the community,” Mr Marshall said.